When you can’t find a ready-made Excel 2007 template that fits the bill, create your own templates from sample workbooks that you create or that your company has on hand. The easiest way to create your own template is to create an actual workbook prototype and then save the file using the template file format (.xltx). Then you can open the file from the Templates folder to create new workbooks as needed. 1Create an Excel workbook that contains all of the elements needed for the template file. These elements can include text, data, comments, formulas, graphics, formatting, and macros that it requires to function. 2Click the Office button and choose Save As. 3Type the name for the template in the File name box. Make sure you use a descriptive name so you can easily pick it out in the future. 4In the Save as Type drop-down list, select Excel Template (*.xltx). If you recorded macros in your template, you need to select Excel Macro-Enabled Template (*.xltm) instead. 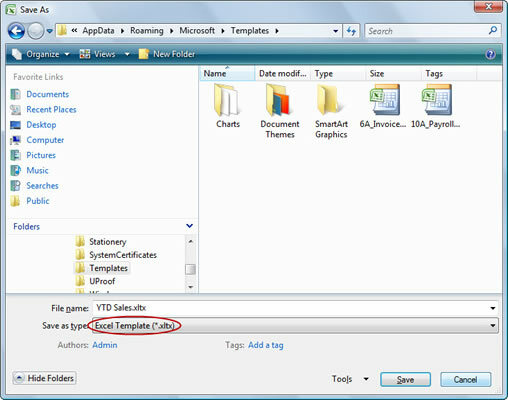 The file is saved to the Templates folder (unless you specify another location). 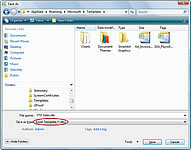 This allows easy access to the file when you later need to create a workbook based on the template.